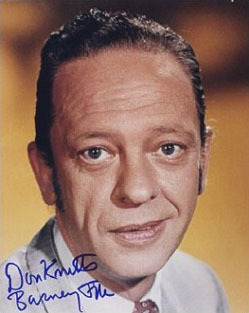 Born to a pair of farmers, Don Knotts was raised "dirt poor" in West Virginia during the Great Depression. During his childhood, Knotts' father became a paranoid schizophrenic and alcoholic, and Knotts sometimes joked that he drove his father crazy. Beginning in high school, he performed as a ventriloquist, with modest success. At 19, he joined the Army, where his duties consisted primarily of entertaining the troops in traveling GI variety shows called "Stars and Gripes". Upon being discharged, he tried breaking into show business as a ventriloquist and stand-up comedian, but found that his thick Southern accent made his act almost unintelligible beyond the South. To overcome the accent, he went to college, majoring in education but with a strong minor in speech. After graduation, his first break came when 25-year-old Knotts was hired to play the decrepit old "Windy Wales" in a revival of the popular radio western Bobby Benson. Knotts first met Andy Griffith when he auditioned for Griffith's hit play, No Time for Sergeants. The two Southern boys soon bonded by wordlessly whittling sticks, and worked together for almost two years on Broadway. They eventually reprised their roles in a well-received film adaptation of No Time for Sergeants, which was Knotts' first movie. Early in his TV career, Knotts played it relatively straight on the soap opera Search for Tomorrow in the mid-1950s. He also played a fidgety chap in recurring bits on the late-1950s Steve Allen Show. When Knotts heard that a sitcom was in development with Griffith as a small-town sheriff, he phoned his friend and pointed out that every sheriff needs a good deputy, but a deputy who is not so good might be funnier. Knotts envisioned Deputy Fife as a bumbling but proud character, clearly not cut out for work as a lawman. His manic performance made the laid-back Griffith seem wiser, and the sheriff's respect for Fife signaled to audiences that the deputy was more than merely a buffoon. "I was supposed to be the funny one on the show," Griffith said in a 2002 interview. "But halfway through the second episode, I realized Don should be the funny one and I should play straight man to him. And that's the best thing we ever did. That's what made the show." Playing Fife, Knotts won Emmys for Best Supporting Actor in 1961, '62, '63, '66, and '67. After leaving Mayberry, Knotts had his own comedy hour, The Don Knotts Show on NBC in 1970, featuring skits with future Radar Gary Burghoff. He also had success as a film star. His first top billing was for The Incredible Mr. Limpet, where Knotts envied the lives of his tropical fish, and after only a few minutes on screen, he fell off a pier at Coney Island and became a fish who fought Nazis. Knotts' films, including The Ghost and Mr. Chicken, The Reluctant Astronaut, and How to Frame a Figg, were ostensibly "family" movies, and kids loved them. His oeuvre, however, should not be dismissed as merely "kid stuff". Knotts' faults and foibles, albeit exaggerated, were universal, and given a feature-length showcase, he could unravel his anxiety, embarrassments, hopes and impossible dreams, heartache, and worries. By the end of a Knotts film, his character's shortcomings were usually overcome when some crisis revealed this everyman's inner nobility and courage. Audiences came to sincerely like Knotts, whether he was Barney Fife, Mr. Furley, or a fish. With his nervous tics, his shaky insecurity hidden under a mask of overconfidence, and a sexual tension so often present (even when Knotts was alone), his best performances spoke to the insecurities of the nuclear age and the sexual revolution. Beginning in the 1970s, Knotts made several comedies with Tim Conway, including The Apple Dumpling Gang, Gus, and The Prize Fighter. Conway & Knotts played worms in an early 2000s series of animated Hermie & Friends videos. Late in life, Knotts and Griffith were reunited on Matlock, where Knotts had a recurring role as a jittery neighbor. In 2004, his home town celebrated Knotts' 80th birthday with a parade, and a Don Knotts Film Festival was held the next summer. He was also honored with the first star in West Virginia's Walk of Fame, in front of the Metropolitan Theater in downtown Morgantown. In his last years, he performed mostly in dinner theater and regional stage productions, and said he enjoyed watching reruns of Seinfeld. He died in 2006.